The options are endless when it comes to choosing a style of frame. For a clean, classic look, a simple black, white or wood frame will let the print shine while brightening up your space and work with any decor style. Metallic frames provide a sleek touch to modern and sophisticated rooms, and decorative frames can be used as a design element or focal accent piece. The purpose of a mat is to separate the art from the glass, provide visual space to focus on the print, and enhance the overall look of your framed artwork. I always recommend using a mat, if possible. Note that all of my prints up to 12x16” include a small white border and are meant for framing with a mat. If your frame does not have a mat (or is a “floating frame”), please make a note at checkout and I will trim the print to size. Keep in mind: Your mat opening will be smaller than the actual print size (example: a common mat opening size for an 8x10" is 7.5x9.5", so a quarter inch around the outside edge of the print will be hidden). This is to prevent the edges of the print from showing behind the mat. The correct artwork scale is crucial to achieving balance in a room. The most common mistake is using frames that are too small for the space—this can create a distracting, cluttered look. On horizontal walls, create a horizontal arrangement; on a taller wall, stack the prints vertically to fill the space. 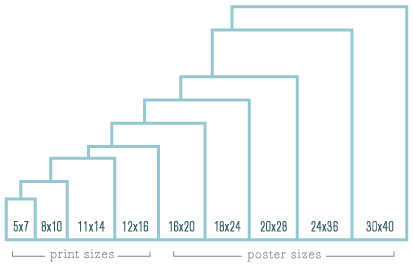 Choose poster size prints for larger walls (like over a couch), or opt for gallery style. When using multiple pieces of art, the wall is your canvas. Hang the artwork close together to create one large focal point, instead of spacing them apart, which causes the eyes to jump around. 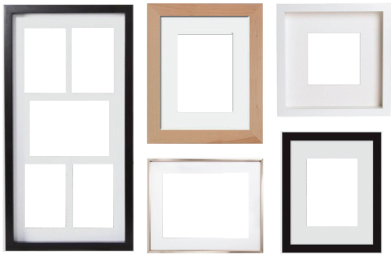 For a bold statement, use frames in varying shapes, sizes and colors and hang them in an asymmetrical arrangement. 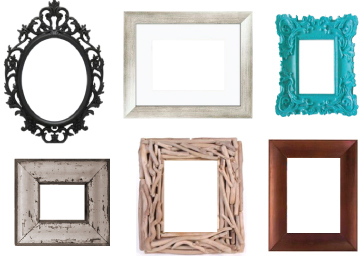 For a balanced and sophisticated look, use larger frames of the same style and hang in a symmetrical pattern. 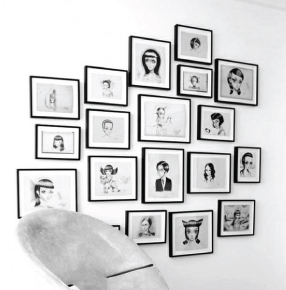 Love the idea of a gallery wall but afraid of a cluttered look? Stick with white matted frames and art in coordinating hues to let the wall become a calming backdrop. Follow my pinterest board for more ideas and inspiration! Frame sources are plentiful these days—any frame you dream up can be made. I prefer the inexpensive and simple route, so my go-to source is IKEA. Also great on price and selection is Target and Walmart. For your custom framing needs, try Michael’s, Aaron Brothers, or Hobby Lobby. 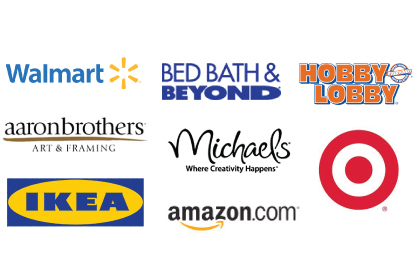 For hard to find sizes, shop online at amazon, ebay, frameusa.com and many more. Note that frames with mats can be used with two different sized prints (with and without the mat). Look for the "mat opening size", not the actual frame size, to match (or be slightly smaller than) the size of your print. Happy Shopping!